Lawyer Jay Porter is struggling to cope with catastrophic changes in his personal life and the disintegration of his environmental law practice. He hasn’t even seen a dime from his last major victory in the courtroom. Time has taken its toll, and he’s ready to quit. But when a girl who was a volunteer for one of the mayoral candidates goes missing on Election Night, 1996, in the neighborhood of Pleasantville, Jay is deeply disturbed. With his reputation on the line, Jay is about to try his first murder in a case that will also put an electoral process on trial, exposing the dark side of power and those determined to keep it. Those wishing to get books signed will be asked to purchase at least one copy of the author's most recent title from Vroman's. For each purchased copy of the newest title, customers may bring up to three copies from home to be signed. This policy applies to all Vroman's Bookstore events unless otherwise noted. Save your Vroman's receipt; it will be checked when you enter the signing line. What: Attica Locke will discuss and sign her newest novel, Pleasantville. When: Tuesday, April 28, 7:00 pm Where: Blue Willow Bookshop, 14532 Memorial Drive, Houston, TX 77079 Admission: In order to go through the signing line and meet Attica Locke for book personalization, please purchase Pleasantville from Blue Willow Bookshop. At the time of your purchase, we will issue a signing line ticket that indicates your place in line. Your book and signing line ticket can be picked up at the event. About the Author: Attica Locke is the author of the widely acclaimed debut novel BLACK WATER RISING, which was nominated for a Los Angeles Times Book Prize, an Edgar Award, and an NAACP Image Award, and was shortlisted for the UK's Orange Prize. She lives in Los Angeles with her husband and daughter. Book: In this sophisticated thriller, lawyer Jay Porter, hero of Attica Locke's bestseller Black Water Rising, returns to fight one last case, only to become embroiled once again in a dangerous game of shadowy politics and a witness to how far those in power are willing to go to win. Fifteen years after the events of BLACK WATER RISING, Jay Porter is struggling to cope with catastrophic changes in his personal life and the disintegration of his environmental law practice. His victory against Cole Oil is still the crown jewel of his career, even if he hasn't yet seen a dime thanks to appeals. But time has taken its toll. Tired and restless, he's ready to quit. When a girl goes missing on Election Night, 1996, in the neighborhood of Pleasantville--a hamlet for upwardly mobile blacks on the north side of Houston--Jay, a single father, is deeply disturbed. He's been representing Pleasantville in the wake of a chemical fire, and the case is dragging on, raising doubts about his ability. The missing girl was a volunteer for one of the local mayoral candidates, and her disappearance complicates an already heated campaign. When the nephew of one of the candidates, a Pleasantville local, is arrested, Jay reluctantly finds himself serving as a defense attorney. With a man's life and his own reputation on the line, Jay is about to try his first murder in a case that will also put an electoral process on trial, exposing the dark side of power and those determined to keep it. Ordering: A limited number of autographed copies of this book will be available for purchase after the event. If you cannot attend the event, and would like a personalized copy of a\ book, please call us before the event at (281) 497-8675. If you can't attend the event or need a copy shipped to you, you may call the store or add the appropriate book to your cart on our website. Payment type must be "CreditCard." In the order notes, add personalization details. To place an international order, please email orders@bluewillowbookshop.com to obtain shipping details and to have items shipped to you. Staff will respond within 24-48 hours. Brentwood - Diane Leslie's Book Group with Author discusses "The Cutting Season"
Diane Leslie's Book Group with Author meets to discuss Attica Locke's novel, The cutting season, on Monday, July 8th at 5pm. The best part? Attica Locke will be joining in the discussion! Caren Gray manages Belle Vie, a sprawling antebellum plantation that sits between Baton Rouge and New Orleans, where the past and the present coexist uneasily. The estate's owners have turned the place into an eerie tourist attraction, complete with full-dress reenactments and carefully restored slave quarters. Outside the gates, a corporation with ambitious plans has been busy snapping up land from struggling families who have been growing sugar cane for generations, and is now replacing local employees with illegal laborers. Tensions mount when the body of a female migrant worker is found in a shallow grave on the edge of the property, her throat cut clean. Taut, hauntingly resonant, and beautifully written, The cutting season is at once a thoughtful meditation on how America reckons its past with its future, and a high-octane page-turner that unfolds with tremendous skill and vision. Attica Locke is a screenwriter who has worked in both film and television. A native of Houston, Texas, she lives in Los Angeles with her husband and daughter. Attica Locke signs The cutting season in Fallbrook. October is National Reading Group Month - saluting reading groups, fostering their growth and promoting the love of literature! In celebration, we are pleased to welcome Woman's National Book Association & featured guests to Vroman's for an Author's Panel. The evening will include short readings by the authors, followed by a q&a and booksigning. Our featured authors for the event are Attica Locke (The cutting season), Hector Tobar (The Barbarian Nurseries), Naomi Benaron (Running the rift), and Richard Kramer (These Things Happen). Founded in 1917, WNBA promotes literacy, a love of reading, and women's and men's roles in the community of the book. About the author: Attica Locke is the author of the widely acclaimed novel Black Water Rising, which was nominated for the Los Angeles Times Book Prize, an Edgar Award, an NAACP Image Award, and the UK’s Orange Prize. A native of Houston, she now lives in Los Angeles. Book: Attica Locke returns with The cutting season, a riveting thriller that intertwines two murders separated by over a century as it boldly tackles the charged themes of race, class, and justice in contemporary America. In post-Katrina Louisiana, Caren Gray manages Belle Vie, a sprawling antebellum plantation where the past and the present coexist uneasily. To stay afloat, the estate’s owners have turned the place into an eerie tourist attraction complete with full-dress reenactments and carefully restored slave quarters. Outside the gates, a corporation with ambitious plans has been busy snapping up land from struggling families, who have been growing sugar cane for generations, and replacing local employees with illegal laborers. Tensions mount when the body of a female migrant worker is found in a shallow grave on the edge of the property with her throat slashed. As the investigation gets underway, the list of suspects grows. But when fresh evidence comes to light and cops zero in on a person of interest, Caren has a bad feeling that the police are chasing the wrong leads. Putting herself at risk, she ventures into dangerous territory as she unearths startling new facts about a very old mystery—the long-ago disappearance of a former slave—that has unsettling ties to the modern-day crime. In pursuit of the truth about Belle Vie’s history and her own, Caren discovers secrets about both cases that an increasingly desperate killer will do anything to keep hidden. Taut, tense, hauntingly resonant, and beautifully written, The cutting season is at once a thoughtful meditation on how post-Obama America reckons its past with its future and a high-octane page-turner that unfolds with tremendous skill and vision. What: Attica Locke will discuss and sign her new novel, The cutting season. When: Wednesday, October 3, 7:00 p.m. Where: Blue Willow Bookshop, 14532 Memorial Drive, Houston, TX 77079 Admission: In order to go through the signing line and meet Attica Locke for book personalization, please purchase The cutting season from Blue Willow Bookshop. A limited number of autographed copies of The cutting season will be available for purchase after the event. If you cannot attend the event, but would like a personalized copy of this book, please call us before the event at (281) 497-8675. As the investigation gets under way, the list of suspects grows. But when fresh evidence comes to light and the sheriff's department zeros in on a person of interest, Caren has a bad feeling that the police are chasing the wrong leads. Putting herself at risk, she ventures into dangerous territory as she unearths startling new facts about a very old mystery—the long-ago disappearance of a former slave—that has unsettling ties to the current murder. In pursuit of the truth about Belle Vie's history and her own, Caren discovers secrets about both cases—ones that an increasingly desperate killer will stop at nothing to keep buried. Taut, hauntingly resonant, and beautifully written, The cutting season is at once a thoughtful meditation on how America reckons its past with its future, and a high-octane page-turner that unfolds with tremendous skill and vision. With her rare gift for depicting human nature in all its complexities, Attica Locke demonstrates once again that she is "destined for literary stardom" (Dallas Morning News). In post-Katrina Louisiana, Caren Gray manages Belle Vie, a sprawling antebellum plantation where the past and the present coexist uneasily. To stay afloat, the estate's owners have turned the place into an eerie tourist attraction complete with full-dress reenactments and carefully restored slave quarters. Outside the gates, a corporation with ambitious plans has been busy snapping up land from struggling families and replacing local employees with illegal laborers. Tensions mount when the body of a female migrant worker is found in a shallow grave on the edge of the property. As the investigation gets underway, the list of suspects grows. Caren ventures into dangerous territory as she unearths startling new facts about a very old mystery—the long-ago disappearance of a former slave—that has unsettling ties to the modern-day crime. In pursuit of the truth about Belle Vie's history and her own, Caren discovers secrets about both cases that an increasingly desperate killer will do anything to keep hidden. This discussion is free and open to the public. Those wishing to get books signed will be asked to purchase at least one copy of The cutting season from Vroman's, and one additional copy for every 3 books they bring from home. Save your Vroman's receipt; it will be checked when you enter the signing line. 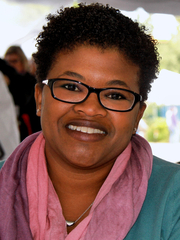 Attica Locke is a writer whose first novel, Black Water Rising, was nominated for a 2010 Edgar Award, a 2010 NAACP Image Award, as well as a Los Angeles Times Book Prize and was longlisted for an Orange Prize in the UK. Attica is also a screenwriter who has written movie and television scripts for Paramount, Warner Bros, Disney, Twentieth Century Fox, Jerry Bruckheimer Films, HBO, Dreamworks and Silver Pictures. She was also a fellow at the Sundance Institute’s Feature Filmmakers Lab and is a graduate of Northwestern University. A native of Houston, Texas, Attica lives in Los Angeles, California, with her husband and daughter. Attica Locke is currently considered a "single author." If one or more works are by a distinct, homonymous authors, go ahead and split the author. Attica Locke is composed of 2 names. You can examine and separate out names.